p4ges - Can Paying 4 Global Ecosystem Services reduce poverty? Between the 30th November and the 11th December, scientists, policy makers, practitioners and campaigners converged in Paris for the 21st meeting of the United Nation Convention on Climate Change. It was heralded as the last chance for an international agreement on climate change. The work we are doing in the p4ges project concerns one important issue which was up for agreement at Paris - that of REDD+ (Reducing Emissions from Deforestation and Degradation). Four members of the p4ges project: Prof Bruno Ramamonjisoa, Prof Tantely Razafimbelo, Dr. HDR Herinsitohaina Razakamanarivo and Jeannicq Randrianarisoa joined the Malagasy delegation at COP to offer support and advice. 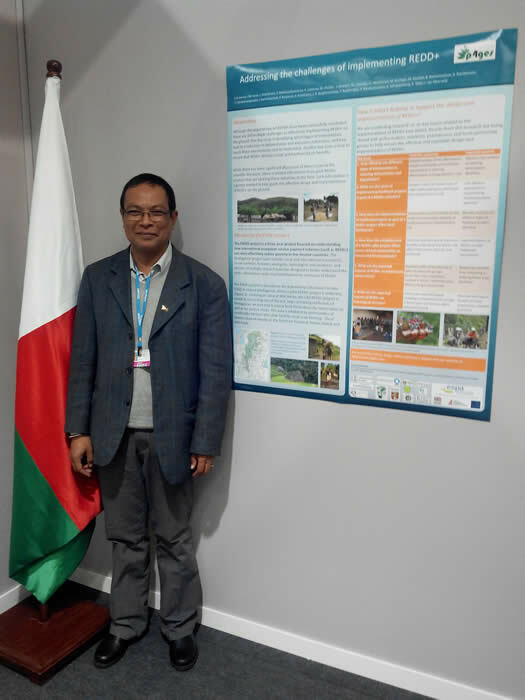 Others representatives of the Malagasy delegation included members of the p4ges national advisory committee: Jean Roger Rakotoarijaona of ONE, Mamitiana Andriamanjato – the country’s REDD+ focal point and Claudine Ramiarison – Director General of Research. Prof Ramamonjisoa made a presentation titled “The challenges of putting in place REDD+ in the context of poverty and diversity". 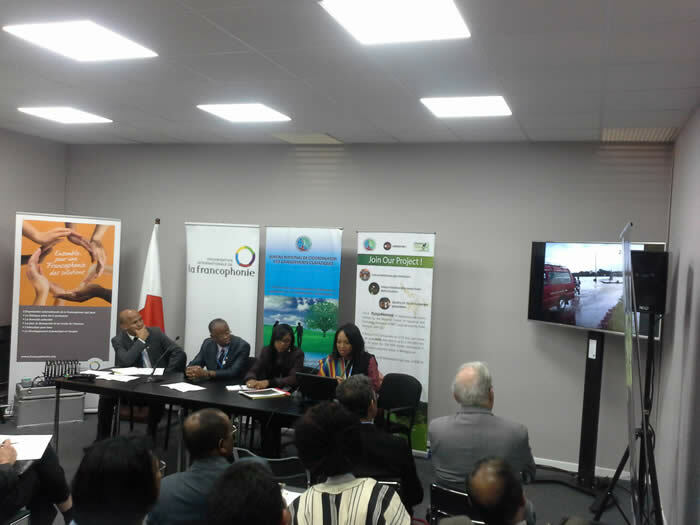 This was part of a round table event entitled "REDD+ : at the interface of biodiversity, climate change and human rights" organised by the Malagasy government, AFNU-Aix (French Association for the United Nations) and the IFDD (Francophone Institute for Sustainable Development). Prof Ramamonjisoa also took part in the round table which followed the event. 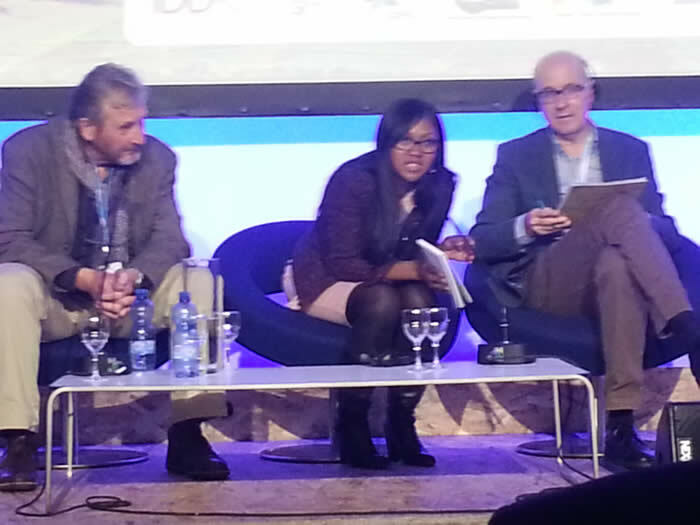 There were excellent questions about implementation of REDD+ in Madagascar and the challenges. 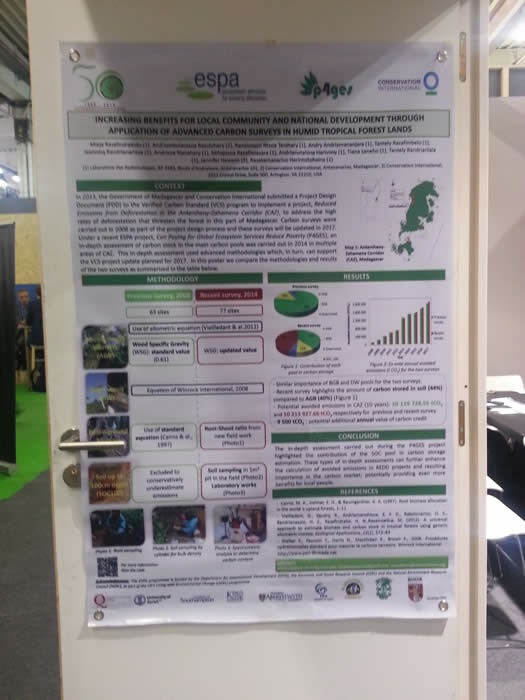 During the “Journée Madagascar” in the Pavillon de la Francophonie, the Director General of Research, Claudine Ramiarison, explained to the audience that p4ges was one of the two most important research projects on ecosystem services in the country. 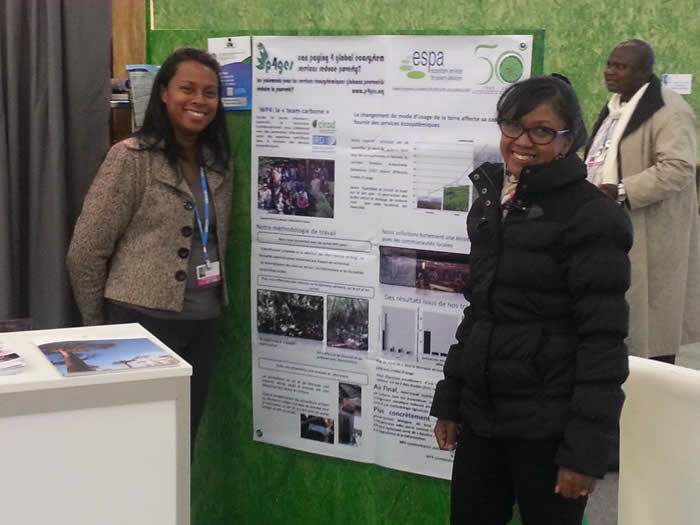 The p4ges team showed two posters about the project on booths that showcased Madagascar’s activities on climate change and also at a Madagascar-focused event in the Pavillon de la Francophonie. Materials from the p4ges project were included in 700 flashdisks containing Madagascar-related information which were distributed at this ‘paper free’ COP. 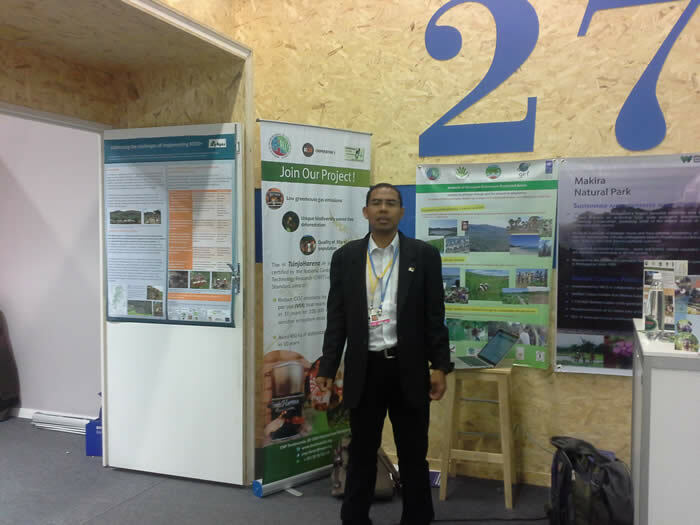 In their role supporting the Malagasy delegation, the p4ges representatives manned the official Malagasy pavilion with representatives of the government such as the Minister of the Environment, Ralava Beboarimisa. They fielded questions about the levels of local participation in the REDD+ processes, research on local knowledge in Madagascar among other things. Jeannicq Randrianarisoa was interviewed by a student from Brown University for The Silenced World to stress the importance of nature-based solutions to climate change and the necessity of PES to contribute to poverty alleviation. Also at COP21, John Roome of the World Bank and the Minister of the Environment, Ecology, Sea and Forests (MEEMF) Beboarimisa Ralava signed a letter of intent in which the World Bank envisages to purchase emission reduction from the northern part of eastern rain forest of Madagascar including CAZ. This is worth several tens of millions of dollars. Given the fact Madagascar has made the pledge to reduce its GHG emissions by 14% and increase its carbon sequestration by 32% by 2030, carbon PES in Madagascar will gain increasing interest. Despite this interest, the national REDD+ strategy is still under development and results from the p4ges project will be key to informing this important national document. The Paris climate conference is being cautiously considered as a positive step forward for tackling climate change. While these high level agreements are important, what happens on the ground is of course vital. Implementing REDD+ in a way which delivers genuine climate benefits while not resulting in a negative impact for local people’s rights or livelihoods is still a big challenge.